And How Does Geothermal Energy Work? What is geothermal energy, and how does geothermal energy work? I will answer these two common questions on this page. For links to other geothermal topics, please see the main page for geothermal energy. Geothermal energy is a form of thermal energy, the internal energy in substances - or more correctly - the vibration and movement of atoms and molecules within substances. This causes friction and results in the creation of heat energy. Geothermal heat originates from the "big bang" - more than four billion years ago - when burning dust and gas consolidated to form the earth. At 6,400 kilometres deep, the earth’s core temperatures reach more than 4,982 degrees Celsius. This geothermal heat continuously flows outwards towards the surface of the earth, heating the surrounding layer of rock - which is known as the mantle. When the temperature is hot enough, some of the mantle rock melts and becomes magma. Magma is lighter than the surrounding rock. It rises up towards the earth’s crust, carrying the heat from below. The magma heats the rocks and water below the earth's crust to temperatures of up to 371 degrees Celsius. Some of the hot water makes its way to the earth's surface through faults and cracks, emerging as either hot water or steam. This results in the formation of hot springs and geysers. The hot water also collects deep underground, trapped in cracks and porous rock. This natural collection of hot water is known as a geothermal reservoir. When we make use of the hot water, steam or hot rock originating from the earth’s core, and turn them into useful energy, it is known as geothermal energy. 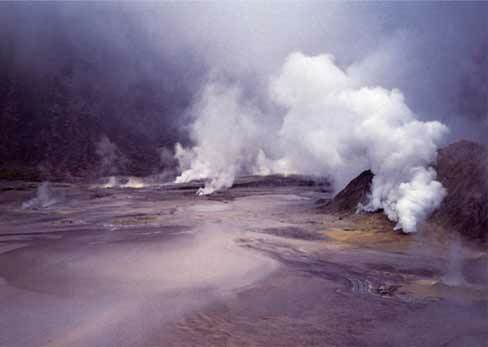 Hydrothermal resources are currently the only commercially viable type of geothermal power. That answers the question of "what is geothermal energy?" So how does geothermal energy work? 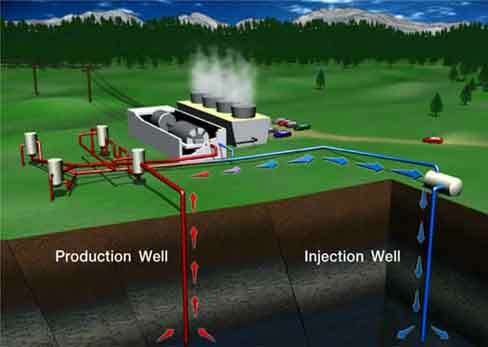 How does geothermal energy work is a good question, and one which I have often been asked. How does geothermal energy work, in relation to creating electricity, is best explained in the section on geothermal power plants. Geothermal energy works for us whenever it is used to heat anything - from water to drive turbines in geothermal power plants, to heating the water in fish farms. Geothermal energy can be used to run heat pumps or in the form of hot water springs for bathing. Simply put, geothermal energy works through the transfer, or direct use, of heat energy from the earth.